After a busy Easter and spring break, I decided to take a step back last week for a much needed break! It’s funny because when I don’t have time to sit around and relax, I crave the time off. When I do take some time off, I miss the workflow. 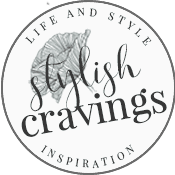 With that being said, along with the constant commotion that work brings to my days, the need to go back to meal planning (this meal planning printable makes it so easy) is always there. We’ve been sticking to specific meals, but recently we decided to switch things up a bit and try to incorporate not only meatless meal nights but also carb free nights. I figured this would open up our menu to lots of easy to make meals while allowing me to easily cook for myself (I’ve been trying to cut down on carbs) and the kids in one shot. Below is a new favorite of ours. 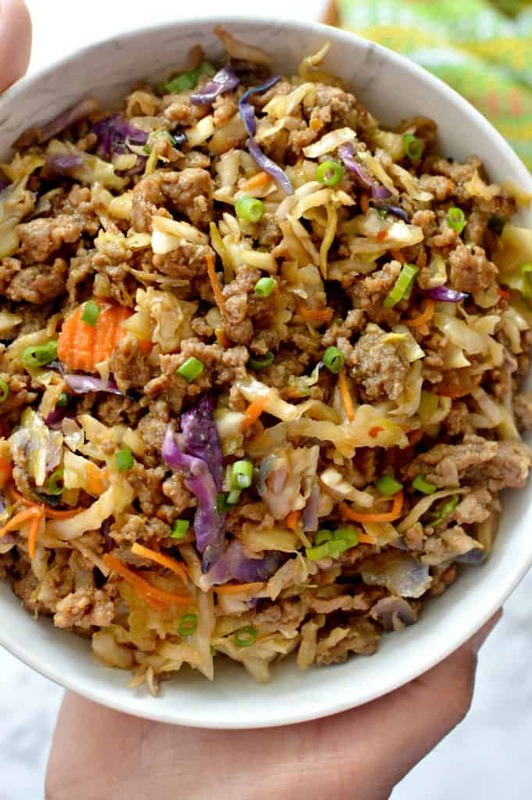 It’s a simple low-carb egg roll in a bowl. I don’t believe in depriving myself and I’m not on a specific diet, but I do feel better when I limit certain foods from my diet. One of my favorite takeout choices is Chinese food and, while I do allow myself to indulge in the occasional dinner combo and egg roll, I just don’t like how my body feels afterwards. 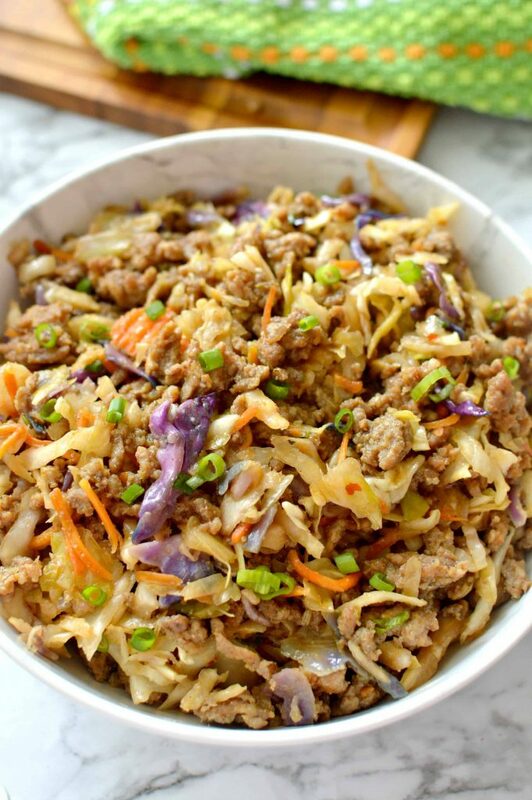 This egg roll in a bowl is a delicious alternative to the classic egg roll! 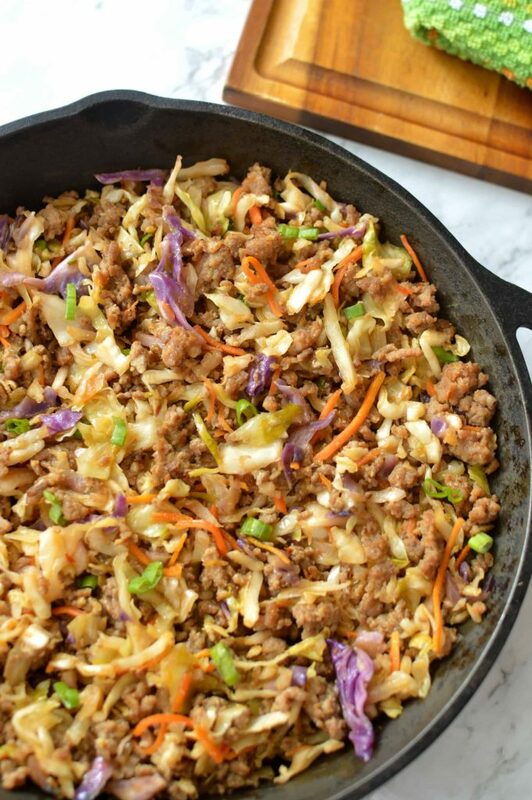 It’s got all the tasty flavors of an egg roll without the carbs and only takes 10-15 minutes to make – you can’t beat that! More Low Carb Recipes You’ll Love! 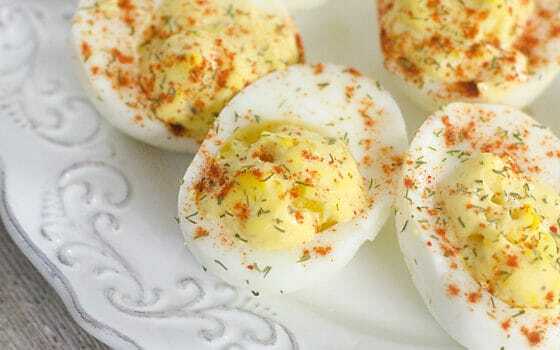 For a spicy kick add 1 tablespoon of red pepper flakes! Cook sausage stirring and crumbling until cooked through. Stir in Cole slaw mix, garlic, ginger, soy sauce and stir. Top with green onions and drizzle with more soy sauce or sweet and sour sauce. 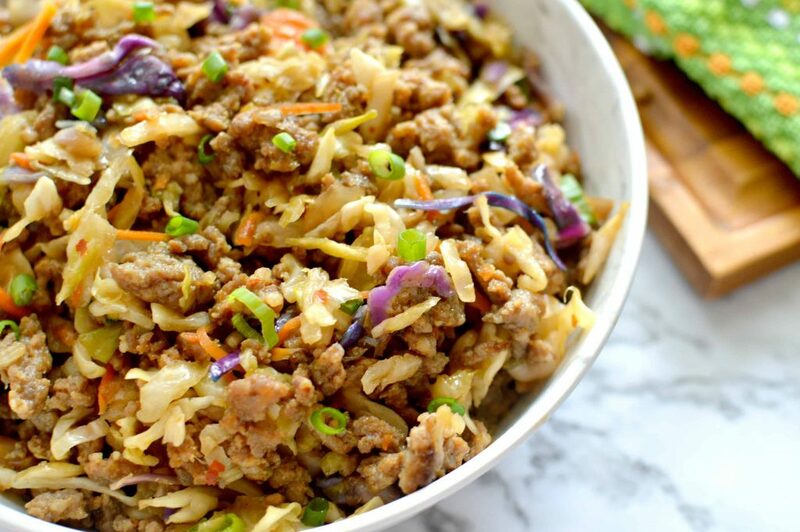 This low carb egg roll in a bowl is also served great together with cauiflower rice (recipe coming soon), quinoa, or white rice! I’m excited to add a few more low-carb recipes like this Chicken Florentine recipe. 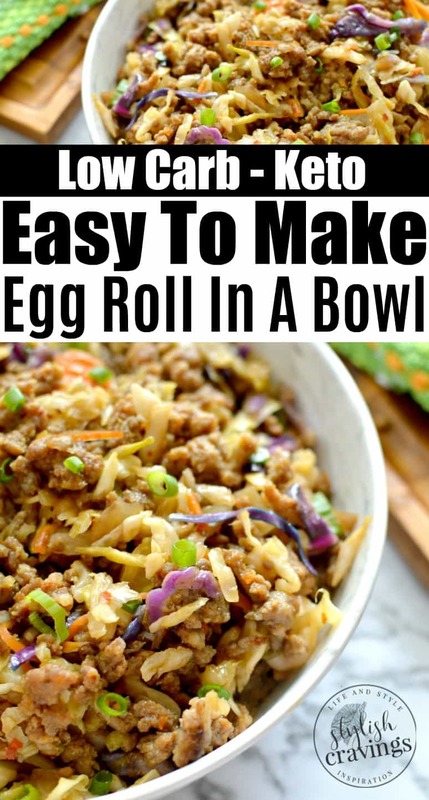 Have you tried making an egg roll in a bowl? For more Keto/low carb recipes visit me on Pinterest! 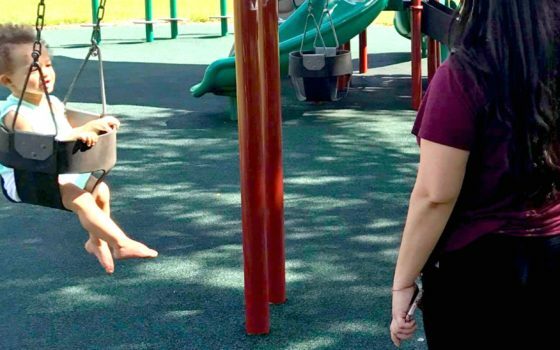 easy inexpensive ways to keep your teen happy during Spring Break! Delicious combination, will do this again. Winner in my house. What kind of sausage is used for the egg roll in a bowl? Ground pork sausage but I’ve also used breakfast and mild Italian sausage and they both taste just as good. What are the nutritional facts on this recipe? Wondering how many servings and how many carbs per serving? This is absolutely delicious! My family loved it. I’ve shared it with everyone in my office. Thank you! Looks good! How many people does this serve?